Bar: Tahiti Bar This 5-½ft wide bar has a 6’6″ wide and ~5′ deep A-frame thatched roof which comes standard with Tahiti thatch, but does have the option of trading out other thatched roof materials. Room for 3 guest, and a bartender, shade, exclusive GRASSBuilt bamboo countertops, and open bamboo plywood facades all come standard on this compact rectangular bar. Built to withstand Florida’s harsh weather. Replacement thatch is easy to order and install, and natural thatch will typically last at least 6-7 years (significantly more in drier climates). Personalize your purchase with custom resin-pour counters, different types of thatch, and custom installed appliances. 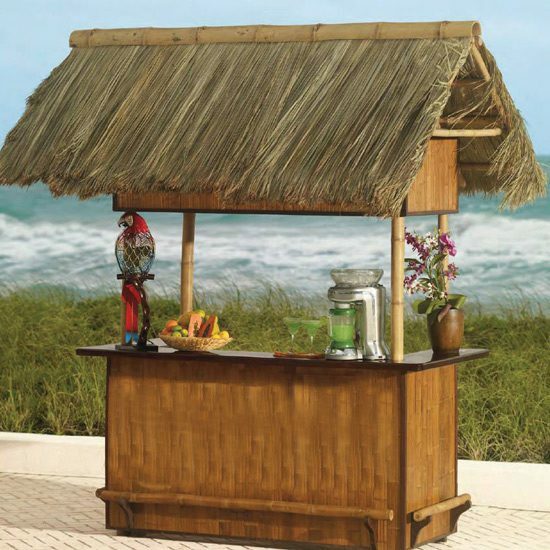 Appearance: This small-medium sized bar is perfect for creating a little tropical ambiance in tight outdoor spaces. GRASSBuilt engineered bamboo countertops, overhead storage, heavy duty bamboo pole foot rest, and bamboo plywood facades. Grade (Int. vs. Ext. ): Perfect for both interior and exterior spaces, although at just over 9ft high, interior uses may be limited. Base: 5.5′ w x 3′ d.
Seats: Seats 2-4 people plus bartender very comfortably. Includes: Includes 3 bar panels, 3 overhead storage panels, 4 poles, foot rest, 1 bamboo frame set, GRASSBuilt engineered bamboo counter, thatch, hardware, and complete set of installation instructions. Bar stools and Mai Tai’s sold separately. Ease of Installation: Moderate installation. Requires 2 people minimally, and may take several hours. Complete detailed installation instructions are included with your purchase. Custom Options: Custom resin-poured, or Safari’s GRASSBuilt engineered bamboo, electrical outlets etc. Talk to your sales rep, as most customer requests can be accommodated. Materials: Bamboo plywood, bamboo poles, bamboo counters, thatch of your choice, solid bamboo frame.